Home » Articles » 176. The Grocery Shopper Has Got the Power! What’s in your fridge? And in the pantry? Is it all healthy, energy providing food? Or is it useless fodder? Show me your food and I know who you are. The food someone has in his or her home shows you how consciously someone lives life. You can see how much attention he or she pays to health. You can see how much interest they have for the basis of their life. 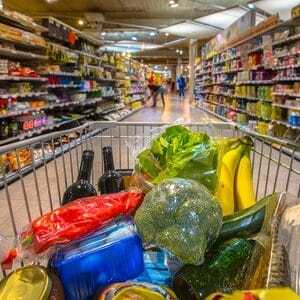 For many people, grocery shopping is an unpleasant activity. Yet, it is an important responsibility. The person who does the grocery shopping is the one who decides what comes into the house. Alcohol, yes or no? Cigarettes, yes or no? Soda, yes or no? Organic vegetables or vegetables contaminated by pesticides? Pork or veggie burgers? You are in control when you do the grocery shopping. Starting today, you can make a new start. Do you want your partner to drink less? Buy less alcohol. See if you can make alcohol into something special, for celebrations only or only during the weekend. And while you’re in the supermarket, be aware that 95% of what you see there isn’t even good for your body. It’s full of sugars, artificial sweeteners, artificial flavors (monosodiumglutamate for example) and artificial colorings. If you realize that our body is close to nature and that the best way to feed it is with unprocessed things the way they are in nature, you’d leave a lot in the store! If it’s not natural, don’t buy it! It will save you a lot of searching, carrying and money! If your family members often drink soda or eat unhealthy foods, being the grocery shopper you are the one who is providing it for them. But what if you were to buy fewer soda or energy drinks? Or didn’t buy them at all? Then you can say, “Sorry, we’re out. How about a cup of tea?” when the soda is gone. It’s a difficult period when you see your family members struggling with the changes but if you’ve got the goal clearly in mind, it’s worth it. Are you brave enough to try it? 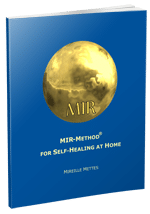 Let the MIR-Method support you with your courage and determination. Be aware that you influence what can be found on the supermarket shelves. If more organic vegetables are sold, more will be added. If customers ask for healthy products with less sugar, the more will be made available in the stores. If you buy good quality devices, more of them will be produced and they will become cheaper for everyone. Battery chickens will disappear and the sale of organic products increase every year. You as a consumer have a lot more influence on this than you realize. As more consumers become aware of this, we can make changes more quickly. Are you in? And how about you? Do you buy less soda, fewer energy drinks and/or alcoholic beverages, and more healthy foods? Has the MIR-Method supported you with this? I’d love to hear about! Please write about it below. Thank you! My wish for you is that your grocery shopping is good for you and your family! Hi Mireille, After 2 strokes I changed my eating/drinking choices years ago and dropped many pounds. I’m lucky to be here to talk about it. My family have struggled with weight and typically blame it on genetics. It’s about choices. Food addiction is tough and removing refined sugar helped me with cravings. Not easy but sometimes life depends on it. Shopping from the outer perimeter of the grocery isles is helpful. Most of the refined items are in the middle rows. MIR method was suggested to me by daughter months ago and I love it. I have passed it on to several people. Thanks so much for this important part of my routine. My grown up son lives in my house. I go shopping weekly, being Vegan, I buy no meat and am member of a Community Supported Agriculture field. I do buy some bottled water for him to take along to work and some extra small cans of soda. Of course he finds it more convenient to eat and drink what s in the pantry, but occassionally he goes out and buys whatever. I influence his food and drink choices a lttle bit. Personally I don t care for sweets, not in drinks not in food. For myself I work from home, so I drink filtered water, lots of tea, some coffee and I do buy some wine or beer to consume at night time. Rather drink some of that than hard liquor. Yes, you obviously do the best you can to positively influence your son. Very good!